I was flipping through some old copies of the Sunday newspaper insert American Weekly (as one does) when I came across these amazing images from 1956. New uniforms for the ladies of civil defense! 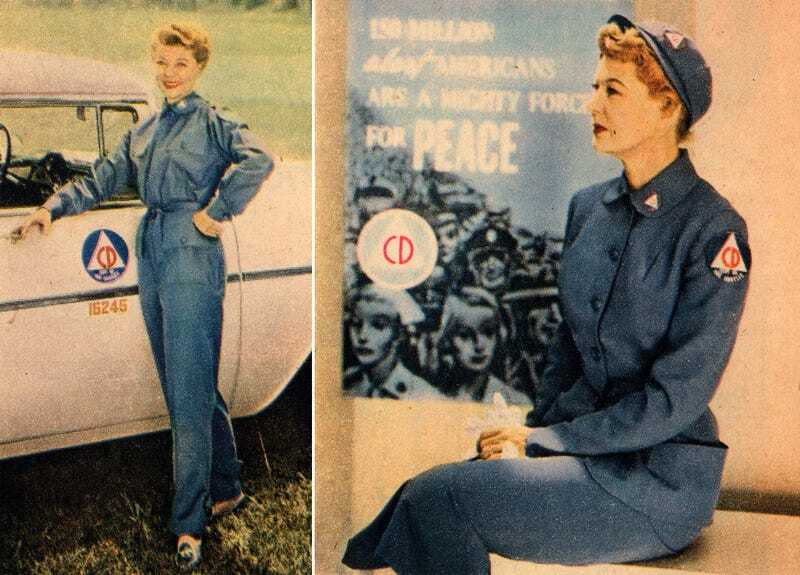 TV actress Harriet Hilliaird, best known for her role on The Adventures of Ozzie and Harriet, is seen modeling the latest in civil defense uniforms. As the text explains, the government had authorized these to be worn by women in the largely volunteer civil defense program. The poplin coveralls cost $12, or about $100 adjusted for inflation. But the two-piece summer-weave suit (reserved for clerks and executives) was going to set you back $31.50, or about $266 adjusted for inflation. Yikes! During the Cold War there was an understandable concern by the U.S. government about what to do in the event that nuclear bombs were dropped on U.S. soil. Civil defense volunteers were supposed to both help prepare people in their community for nuclear war, and also help coordinate people should it actually happen. Is it just me or do those uniforms look vaguely Soviet? Apparently to beat the Ruskies, we had to dress like them. Admittedly, I don't know much about civil defense fashion. But you can bet that I'm now dying to learn more. I'll be sure to report back with what I find, but for now just enjoy the uniform for the end of the world.